The Super 8 Woodstock, Illinois is conveniently located off Hwy 47and 14. 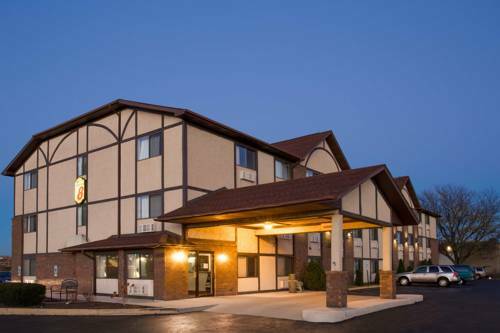 The motel is located near Crystal Lake, Chicago, and Rockford, Illinois and just minutes away from Illinois Railroad Museum and Woodstock Historic Town Square. Other attractions in the area include Donleys Wild West, Woodstock Antique Mall, Woodstock Opera House, Prime Outlet Mall and Lake Geneva. We features Free High Speed Wireless Internet, Elevator, Large RV/Truck/Bus Parking and Superstart Breakfast. Miniature stone buildings were part of a folk art village created by the late August Klatt in his yard during the 1930s. The tiny structures were moved when the highway was widened and the park was created.